The Apple HomePod is Apple's smart speaker for playing music, interacting with Siri, controlling the smart home, and more. Think of it as Apple's competition for the Amazon Echo, Google Home, and other smart speakers. 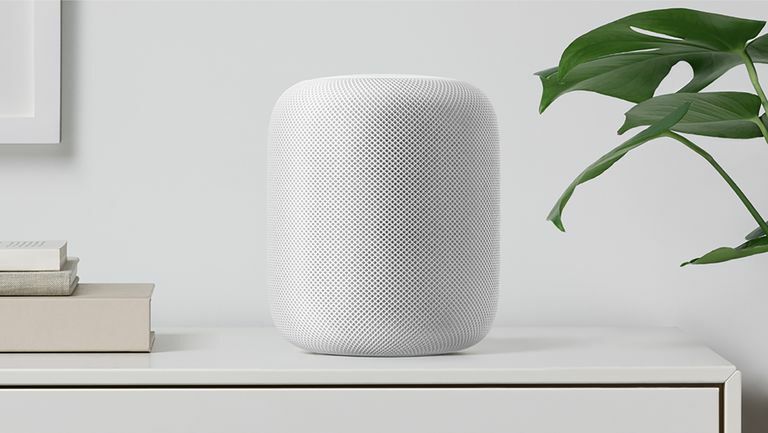 The HomePod is a small, Wi-Fi-enabled device that packs a set of powerful speakers and microphones to deliver a top-notch music experience to any room. It's a bit like one of those ubiquitous wireless Bluetooth speakers, but built into Apple's ecosystem and given the high-end, high-technology, great-user-experience Apple treatment. What Music Services Does the HomePod Support? The only streaming music service natively supported by the HomePod is Apple Music, including Beats 1 Radio. Native support in this case means that you can play music from Apple Music and Beats 1 by interacting with Siri. Both options can also be controlled via an iPhone or other iOS device. While Apple hasn't announced anything, it would be slightly surprising if HomePod never adds native support for other services. Pandora seems like an obvious choice, with services like Spotify likely to take a lot longer (if ever). Given Apple's habits with things like this, don't expect to see native support for any third-party services for a while. Are There Other Native Sources of Music? Yes. While Apple Music and Beats 1 are the only streaming services supported by HomePod out of the box, a number of other Apple-centric music sources can also be used. With HomePod, you can access all of the music you've ever bought from the iTunes Store, your iCloud Music Library with all music added to it via iTunes Match, and the Apple Podcasts app. All of these sources can be controlled via Siri and iOS devices. Yes, the HomePod does support AirPlay 2. AirPlay is Apple's wireless audio and video platform for streaming music from one device to another, such as speakers. It's built into the iOS and so it's present on the iPhone, iPad, and Macs. Can the HomePod Be Used with Spotify and Other Music Services? While Apple Music is the only natively supported streaming service for the HomePod, any other music service whose app supports AirPlay can be used with the HomePod, too. For instance, if you prefer Spotify, just connect to the HomePod via AirPlay and play Spotify to it. You just won't be able to use Siri on the HomePod to control Spotify. AirPlay is also used for HomePods to communicate with each other when there's more than one in a house. More on that in "Can the HomePod Be Used in a Multi-Room Audio System?​" below. Yes, but not for streaming music. The HomePod doesn't work like a Bluetooth speaker. You can only send music to it using AirPlay. The Bluetooth connection is for other kinds of wireless communication, not for audio streaming. What Makes the HomePod Good for Music Playback? Apple has engineered the HomePod specifically for music. It's done this both in the hardware used to build the device and in the software that powers it. The HomePod is built around a subwoofer and seven tweeters arrayed in a ring inside the speaker. That lays the foundation for great sound, but what really makes the HomePod sing is its intelligence. The combination of speakers and six built-in microphones allows the HomePod to detect the shape of your room and the placement of furniture in it. With this information, the HomePod can automatically calibrate itself to deliver optimal music playback for the room it's in. This is like Sonos' Trueplay audio optimization software, but it's automatic instead of manual. This room-awareness also allows two HomePods placed in the same room to recognize each other and work together to adjust their output for optimal sound given the shape, size, and contents of the room. The HomePod is built around the Apple A8 processor, the same chip that powers the iPhone 6 series. With that kind of brain, the HomePod offers Siri as a way to control the music, though Siri does a lot more than that in the HomePod, as we'll see in the rest of this article. You can tell Siri what you want to play and, thanks to the support for Apple Music, Siri can draw from that service's over 50 million songs. You can also tell Siri what songs you do and don't like to help Apple Music improve its recommendations for you. Siri can add songs to an Up Next queue. It can also answer questions like "who's the guitarist on this song?" or play songs based on knowing just some of the lyrics. So This is Apple's Version of the Amazon Echo or Google Home? Sort of. In that it's an Internet-connected, wireless smart speaker that can play music and be controlled by voice, it very much resembles those devices. However, those devices support a much wider range of features, and integrate with many more products than the HomePod does. The Echo and the Home are more like digital assistants for running your home and your life. The HomePod is more of a way to improve your experience of music in the home, with some extra smarts added on. Does That Make the HomePod Apple's Version of Sonos? That comparison seems more apt. Sonos makes a line of wireless speakers that stream music, can combine into a whole-home audio system, and are geared more for entertainment than functionality. The inclusion of Siri makes the HomePod seem like the Echo, but in terms of its functionality — and how Apple is talking about it— Sonos' products are a better comparison. Can It Be Used in a Home Theater? Yes, but there are some things you need to make this work. First off, you need an Apple TV to serve as the centerpiece of this home-theater set up. The HomePod won't work as a "dumb" speaker attached to a standard TV. After that, you'll need more than one HomePod connected to the Apple TV. While you could use a single HomePod as the audio output for your TV, that's not really a home theater. You need multiple HomePods to create a multi-channel home theater system. Can the HomePod Be Used in a Multi-Room Audio System? Can You Add Features To the HomePod Like With the Echo? This is probably the major thing that sets the HomePod apart from smart speakers like the Amazon Echo or Google Home. On those two devices, third-party developers can create their own mini-apps, called skills, that provide additional features, functionality, and integrations. The HomePod works differently. There are a set of commands built into the HomePod for things like controlling music, checking your calendar, sending and receiving texts with Messages, and making calls with the iPhone Phone app. Developers will be able to create similar features. The primary difference between the HomePod and Echo or Home, though, is that these features are not installed on the HomePod itself. Rather, they are added to apps running on the user's iOS device. Then, when the user speaks to the HomePod, it routes the requests to the iOS app, which performs the task, and sends the result to the HomePod. So, the Echo and Home can stand on their own; HomePod is tightly tied to an iPhone or iPad. For more tips on how to use the HomePod to perform tasks, check out 134 HomePod Skills to Know. Is Siri the Only Way to Control the HomePod? No. The device also has a touch panel on the top to let you control music playback, volume, and Siri. So Siri Is Always Listening? Yes. Like with the Amazon Echo or Google Home, Siri is always listening for spoken commands to respond to. However, you can disable Siri listening and still use the other features of the device. Does It Work With Smart-Home Devices? Yes. The HomePod functions as a hub for smart home (which is basically an Internet of Things) devices that are compatible with Apple's HomeKit platform. If you've got HomeKit-enabled devices in your house, speaking to Siri via the HomePod will control them. For instance, saying "Siri, turn off the lights in the living room" will put that room into darkness. What Are Requirements for Using It? The HomePod requires an iPhone 5S or newer, iPad Air, 5, or mini 2 or later, or a 6th Generation iPod touch running iOS 11.2.5 or higher. To use Apple Music, you'll need an active subscription. The HomePod went on sale in the U.S., U.K., and Australia on Feb. 9, 2018. Since then, Apple has expanded sales of the device to many other countries around the world. You can learn more about the HomePod, including global availability and where to buy it, on Apple's HomePod page. If you've already got one and you're ready to get started be sure to check out our tutorial: How to Set Up and Use Your HomePod.